Was There Such A Thing As “Original Sin” In Early Church? The doctrine of ” Original Sin” was created in the Western Church, first suggested by St. Augustine[iii], and later systematized and dogmatized by Anselm in the Latin Church. Augustine’s doctrine of Original Sin was born from his attempt to fight the heresy of Pelagianism. Pelagius, the British monk, opposed the idea that the divine gift of grace was necessary to perform the will of God. Pelagius believed that if we are responsible for obeying the commandments of God, then we must all also have the ability to do so without divine aid. He went on to deny the doctrine of Ancestral Sin, arguing that the consequences of Adam’s sin are not passed on to the rest of mankind. Adam’s sin affected Adam alone, and thus infants at birth are in the same state as Adam was before the Fall. Augustine took a the different view of the Fall in opposition to Pelagius, arguing that mankind is utterly sinful and incapable of any good. This dispute between Augustine and Pelagius did not reach the East. So St. Chrysostom’s views were not so agitated by these disputes in the West. Chrysostom, while claiming that all human beings are made in the image of God, believed that the Ancestral Sin brought corruptibility and death not only to Adam but to all his descendants [iv], weakening his ability to grow into God’s likeness, but never destroying God’s image i.e. free will. Chrysostom represents the consensus of Greek patristic writers who interpret the Fall as “an inheritance of sinfulness as a result of mortality”. Later, Chrysostom’s position was echoed by St Athanasius the Great, who claimed that we are not guilty of Adam’s sin, though we inherit a corrupted nature[v]; but our free will remains intact. Also, the same position was presented by St. Cyril of Alexandria who says, “How could we, who were not yet born, all be condemned with him, even though God said, ‘Neither the fathers shall be put to death because of their children, nor the children because of their fathers, but the soul which sins shall be put to death’? (cf. Deut. 24:18)?”[vi] . Furthermore an inherited original sin does not correspond with the Angel’s salutation to the Virgin Mary, ”Rejoice thou who hast been shown grace, the Lord is with thee; blessed art thou among women”. [vii] How Mary to be blessed if she is even deprived from any goodness by Adam’s sin? Interestingly, John Meyendorff explains how the deficient Latin translation of the text may have contributed to the difference in the Latin interpretation of the Ancestral Sin: He says quoting Romans 5:12 ‘In this passage there is a major issue of translation. The last four Greek words were translated in Latin as in quo omnes peccaverunt (“in whom [i.e., in Adam] all men have sinned”), and this translation was used in the West to justify the guilt inherited from Adam and spread to his descendants. But such a meaning cannot be drawn from the original Greek’. [viii] As the Greek does not have the “in whom” part. In the end, the idea of Original Sin led to another problem of the depressing idea of total depravity of human nature. This idea did not represent any challenge to the early church fathers as they maintained that even though mankind is in a fallen state, the image of God was not destroyed but only distorted. The earliest understanding of the church maintained that Man did not inherit any ”Original Sin” from Adam, rather inherited his mortality and sinful nature. [iv] Chrysostom says “How then did death come in and prevail? “Through the sin of one.” But what means, “for that all have sinned?” This; he having once fallen, even they that had not eaten of the tree did from him, all of them, become mortal.” Homily 10 on Romans. This entry was posted in bible, Christianity, Church, Church Fathers Writings, Jesus, Theology and tagged bible, Christ, Christian, Christianity, Church Fathers Writings, Jesus, Theology. Bookmark the permalink. 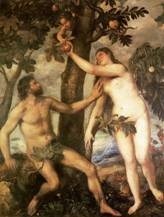 2 Responses to Was There Such A Thing As “Original Sin” In Early Church? The funny thing to me is the number of pastors who will admit that original sin didn’t exist for the early church and that its all based on a mistranslation, and then go right on teaching it and insisting on it as if they hadn’t just disproved the whole thing. I hope YOU aren’t one of those immoral lying bastards. No, I am not a Calvinist !!! I do believe in human free will to choose, and even the freedom to submit free will to the grace of God.